DENVER – As home prices continue to rise in Denver and its surrounding cities, it’s becoming increasingly important to look at geography when searching for a house to buy. Across the metro area, the median home price has risen by nearly 8 percent over the past 12 months. It now stands at $420,000, according to the latest data from the Denver Metro Association of Realtors. Looking specifically at single-family detached homes, the median is even higher at $452,500. 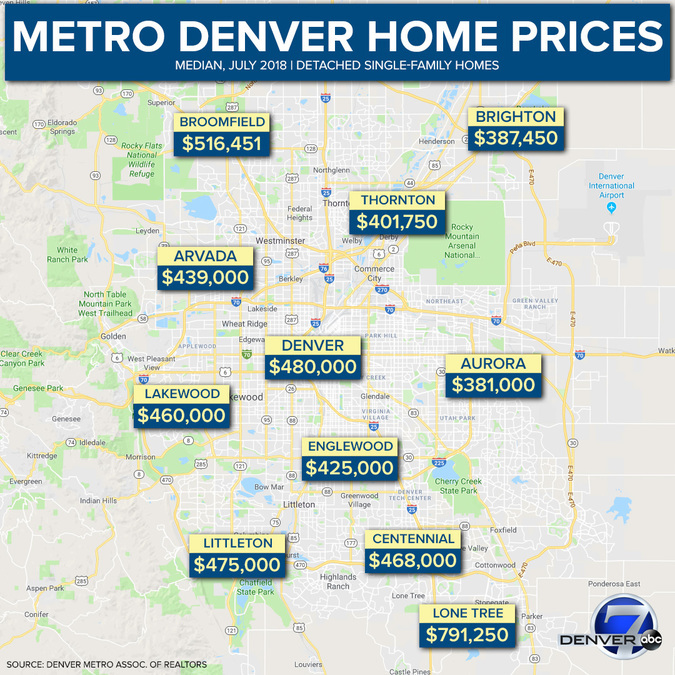 However, those prices vary considerably from one end of the metro area to the other, from anywhere in the $300,000 range in some of the northern suburbs to nearly $800,000 in Lone Tree. All of the cities we looked at in the Denver metro area have seen prices increase in the detached single-family home market except for Lone Tree, which has seen its median drop by 3.4 percent in the past 12 months. Below is the latest home price info for some of the metro’s largest cities. Note: All home prices below are for detached single-family homes as reported by the Denver Metro Association of Realtors as of July 18, 2018.